Trying to get the citizens of our country to actively focus on any one thing at the same time is as probable as successfully catching a gnat swarm with a pool net. 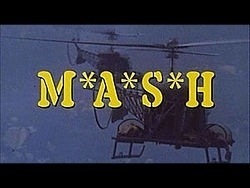 However, that’s just what the series finale of the television series M*A*S*H* nearly accomplished on this day back in 1983. Without aid from a TiVo, a YouTube, or a DVR, roughly 125 Million people tuned in to watch Hawkeye depart the storied 4077 camp. Quite a bow after 11 years of passionate story telling and barbing over hot lips Hoolihan. I’ll be surprised if we can get that many people out to the presidential election this year.